Hotel Emperor palms is a boutique Hotel and providing 3 Star services . It is located in the Karol bagh and 1 minute walking distance from Karol bagh metro station. Its distance from Indira Gandhi Airport is approximately 18 kms. This Hotel is situated at the approachable distances of 3km, 4 kms and 10 kms from New Delhi, Old Delhi and Nizamuddin Railway Stations respectively. This 3 star hotel is in close proximity to Connaught Place, one of the most bustling entertainment and shopping hubs in the city. 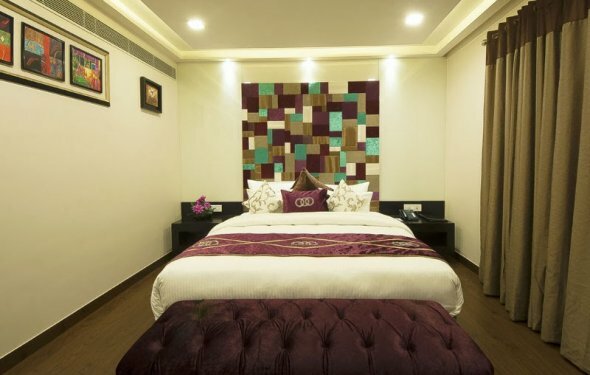 Hotel rooms follow a typical European style theme fitted with contemporary comforts like hair dryers, tea/ coffee makers, rain showers with cubicles, pocketed and bonnell mattress which provides a great sleeping pleasure, hotel offers categories of Emperor Room, Royal Room, Executive Room. All the rooms have an intriguing blend of comfort and style. The hotel has multi cuisine restaurants. The restaurants serve multi cuisines such as Indian, Chinese, Continental as well as American specialties. 24 hours room service is provided for in room dining. Staff of the hotel is very friendly and supportive. There is a 24 hours generator backup with AC to avoid inconvenience related to electricity. A Travel Desk is well trained to fulfill the travel requirements of Guests. Most of the rooms have wheelchair access. . Guests can avail the laundry services. All major credit cards are accepted. Fax machine and computer can be provided on request. 24hours Internet/Wi-Fi access is available in the hotel. A well appointed business centre is provided for business travellers. Other facilities provided by the hotel include free airport pick up service, baggage storage on request, lift or elevators, 24 hour money changer, free car parking, safe deposit lockers, international and domestic ticketing, car and coach rental, package tours, hotel booking throughout India, sightseeing desk, free newspaper at lobby, taxi for airport at counter, 24 hours security, guide service, fax and photocopying and medical services including doctor on call. With commercial centres and historical landmarks in its proximity, the hotel is a suitable choice for both leisure and business travellers. For corporate guests, it offers extensive facilities, including business centre, a multi-functional hall and secretarial services. Other hotel facilities include 24-hour airport transfer, travel desk, power backup, foreign exchange, luggage storage and car parking. Guests can savour a variety of delicacies from Indian, Chinese and Continental cuisine served at the on-site 24-hour restaurant, featuring a stylish decor.